Throughout the early part of the war, Supermarine and Rolls Royce had done a great job at keeping the Spitfire competitive with its obvious adversary the Bf109. In fact it could be said that for most of the time, the RAF pilots had a slightly superior aircraft. The MkV in service throughout 1941 was a fine machine incorporating several modifications to the earlier MkI/II models learnt through combat experience. The MkV refinements included the single stage supercharged Merlin 45, and twin 20mm cannons. In this guise it could comfortably take on the latest version of Messerschmitt, the 109F. What the British didn't see coming was Kurt Tanks's Focke Wulf 190. The FW190 was a brilliant design, intended as a back up to the 109 and employing a supposedly less desirable engine more usually associated with Bomber designs. By the ingenious use of an in-cowl cooling fan and clever routing of the exhaust system, Kurt Tank managed to cowl an 1800 hp twin row radial engine in an incredibly tight cowl, resulting in a very drag efficient fighter. The 190 was a thoroughbred from day one. When this aircraft appeared in service it was the best fighter in the world. Fast, agile and heavily armed, this beautifully engineered aircraft really upset the applecart. The first encounters mid Channel with the 190 proved disastrous. The MkV Spitfire was completely outclassed and the German pilots knew it. With their new confidence the Luftwaffe fighter pilots hurled themselves into combat with renewed vigour and were often reported as "slashing through our formation like a pack of sharks" by allied aircrew. Something had to be done, and fast! In the meantime, Rolls Royce had been working on a new version of the Merlin intended for high altitude bomber application. The new engine, the Merlin 61, had a two stage, two speed supercharger, the idea being to ram a lot more fuel and air in when flying through the thinner atmosphere at medium to high altitude. As the now inadequate MkV airframes were coming off the end of the production line like so many cookies, it seemed an obvious experiment to fit one with this new engine. It was about nine inches longer, so some new cowl panels were required, but apart from that, the swap was fairly straightforward. The airframe remained unchanged. A four bladed propeller was fitted to absorb the extra power, and individual exhaust ejectors added a little residual thrust. The improvement was remarkable. Top speed increased from around 370mph to 410 and more importantly the MkIX continued to climb like a "homesick angel" when the MkV began to run out of steam above 20,000 feet. In a very short period of time the tables had turned again. The MkIX was easily a match for the FW190 and still retained the pleasant and familiar handling characteristics of its predecessor. Although a quick fix, the MkIX was probably the best compromise of all the marks and somehow with its longer nose, it just looks right. Many would say perfect! 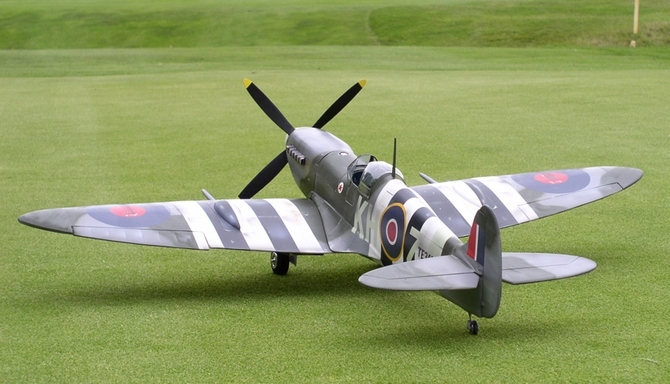 It has often been said that model Spitfires can be difficult to fly, and that despite the desire to do so, nobody should attempt one without years of experience. Given that the pilots of the full size consistently describe the handling qualities as delightful, and that the stall is gentle and benign this is surprising. In fact captured examples flown by the Luftwaffe were described as "childishly simple to fly". At Warbird Replicas we started flying .40 size Spitfires in 1995, and although not as near to scale as the current MkIX model, they were a very realistic representation of the marque. 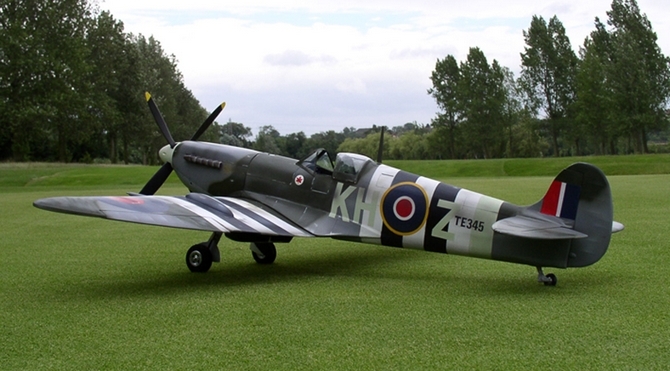 I have had many club pilots, build and fly our Spitfire as their first low wing model. 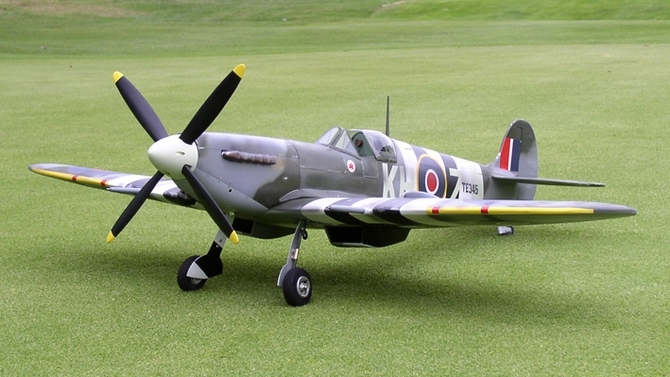 This is not to say that everyone can do the same but if any model flyer can handle a low wing sport model, they could certainly fly the Warbird Spitfire. The latest version, our new MkIX represents the pinnacle of our fifteen years experience on this size model. The model was designed straight from accurate drawings of the full size reduced to 1/8 scale with one or two clever aerodynamic modifications to make the model a practical everyday flyer. Jig tabbed fuselage means that your Spitfire appears before your eyes in a matter of hours. Take a good look at the pictures, and you have to concede that there is not a better looking Spitfire kit on the market. Theres now no longer the need to settle for one of the many poor far eastern offerings of .40 size Spitfires that exist, you now have the opportunity to build and fly a true representation of this iconic British fighter. So why not be the envy of your club, join the ranks of Johnny Johnson and Al Deere and take your own MkIX Spitfire into combat? Construction is quick and easy, the kit includes cowl, canopy & scoops, exhaust stacks, fuel tank, tailwheel, step-by-step fully illustrated instructions and plan, CNC plywood parts and hand picked laser-cut balsa.